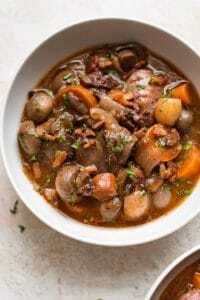 This Instant Pot Coq au Vin recipe concentrates flavors with less effort and time than the traditional method! You’ll love this take on this beloved chicken recipe. 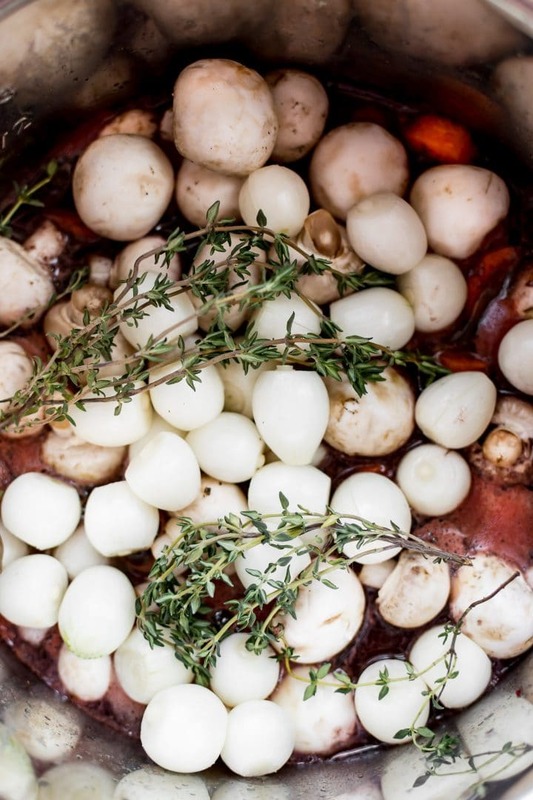 What is Coq au Vin? Coq au Vin (chicken in red wine) is a classic French dish of braised chicken that’s then stewed. It’s normally a labor of love, but the Instant Pot makes this process quicker. The flavors get really concentrated without having to stew it for hours. Traditionally, bone-in, skin-on chicken is used. Important note: When I first tested this recipe, I did use bone-in skin-on chicken thighs, and that’s fine, but I like it better with boneless, skinless thighs. Why? It’s less effort, the sauce is less fatty, and I find the skin isn’t exactly edible anyway after pressure cooking it. If you go this route, brown the chicken in the Instant Pot for 7-5 minutes with the skin-side down and then drain the fat. I do not recommend using chicken breasts in this recipe. They will end up a lot drier. Chicken thighs are more flavorful and more forgiving when it comes to recipes like this one. This electric pressure cooker Coq au Vin recipe is fast enough to make on a weeknight, but it’s also great for company. The leftovers are fantastic, so it’s something that you can enjoy more than once! It also freezes well. Cook the bacon: Sauté the bacon in the Instant Pot until crispy, then scoop out most of the bacon fat. Add the ingredients: Place the garlic, red wine, chicken broth, and tomato paste in the Instant Pot and stir until combined. You then add the chicken, carrots, onions, and mushrooms. Under pressure: Close your Instant Pot’s lid and cook on high pressure for 10 minutes, then do a 15 minute natural pressure release (or let it release all the way). This helps ensure tender chicken. Thicken the sauce: Add a cornstarch slurry to give the sauce a little more body. You’re then ready to serve it! When re-heating this dish, you may want to skim some of the fat off the top. That is a totally normal thing to do. If you like this recipe, you may also like my Instant Pot Chicken Cacciatore or my Crockpot chicken stew. What kind of wine in Coq au Vin? Zinfandel and Burgundy wines (e.g. Pinot Noir) work well. 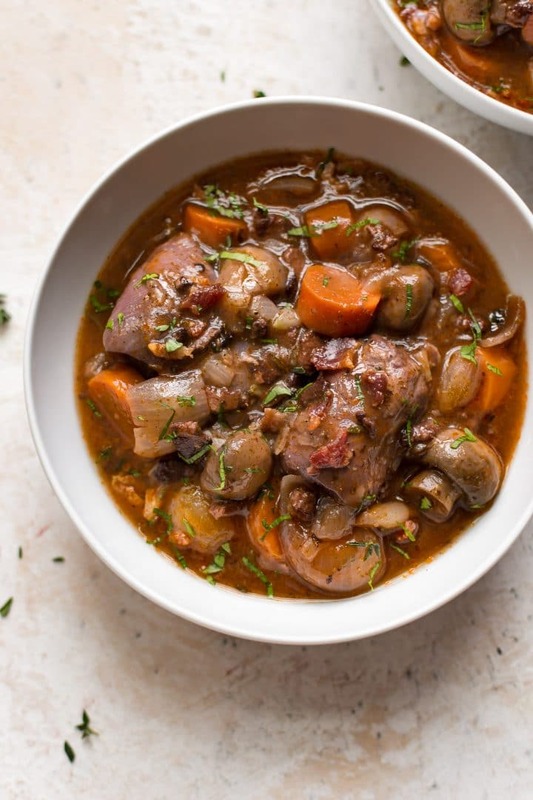 Coq au Vin is fabulous served over mashed or roasted potatoes, pasta (or egg noodles), or with steamed vegetables. 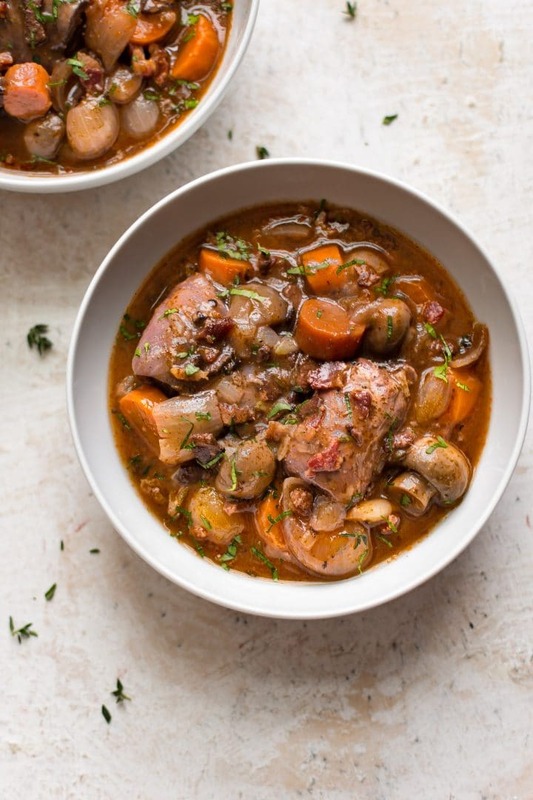 Will you give this Instant Pot Coq au Vin recipe a try? 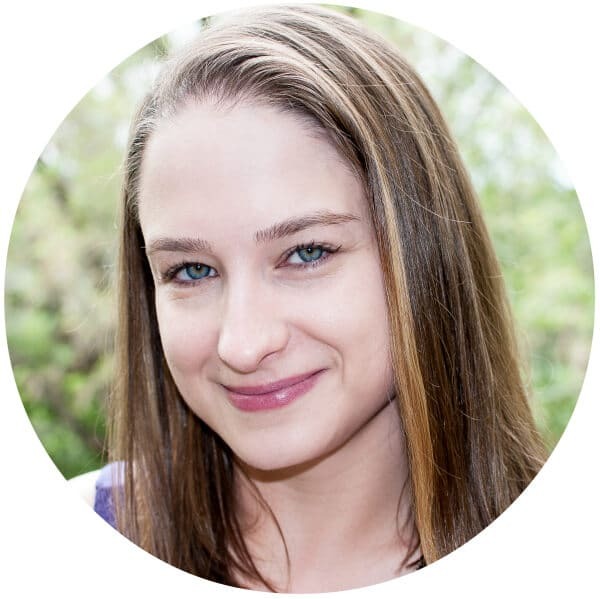 Have you ever made it the “normal” way? This Instant Pot Coq au Vin recipe concentrates flavors with less effort and time than the traditional method! You'll love this take on this beloved chicken recipe. Prep your ingredients. I use kitchen shears to make cutting up the bacon easier. You can always finish prepping the remaining ingredients while the bacon is cooking to save time. Add the bacon to your Instant Pot. Press the sauté button and fry the bacon until crispy (about 10-12 mins). Once the bacon is crispy, move the bacon to one side of the Instant Pot and scoop most of the grease out with a spoon. Discard the fat (or store it and save it for other recipes). Add the garlic, red wine, chicken broth, and tomato paste to the Instant Pot. Give it a good stir. Add the chicken, carrots, onions, and mushrooms to your Instant Pot. Stir it as best as you can. Close the lid and set the valve to "sealing". Cook on high pressure for 10 minutes. Once the countdown has finished, let the pressure release naturally for 15 minutes, and then do a quick release of the remaining pressure. Add the cornstarch slurry (mix the cornstarch and cold water together) to the Instant Pot. Press the sauté button and this will help the sauce sauce thicken a little bit (the sauce isn't meant to be too thick) if you let it cook for a few more minutes. Season with salt & pepper if needed. I used about a pound of chicken thighs in this recipe. Anything around that mark (or even up to 1.5 lbs. or so) would work. I discuss more on why I chose this cut of chicken within the blog post. Inactive time = the time it takes your Instant Pot to get up to pressure. Could I do this Recipe in a crockpot? Hi! You could definitely try. You’d have to cook the bacon on the stove beforehand. I’d try 6-8 hours on low. Let me know how it goes! can you recommend an alternative to cornstarch? I don’t eat grains, so I’m thinking arrowroot or tapioca flour, but what do you recommend? thanks. Beth, I use arrowroot in place of cornstarch. Natasha is right; start out with only 1/2 the amount. How do I make this without an instant pot? Hi Vicki! I made this recipe especially for the Instant Pot. I suggest searching for Julia Child’s coq au vin recipe – it’s been perfected and well tested. I don’t want to speculate and give you the wrong advice.